October 31, 1983, has been tentatively scheduled for the initial meeting of the Horror/Occult Writers League (H.O.W.L. ), a project spearheaded by horror-thriller author Robert McCammon, who regards the formation of the group as a step toward bestowing a separate-genre status that would be of benefit to writers, readers and booksellers. 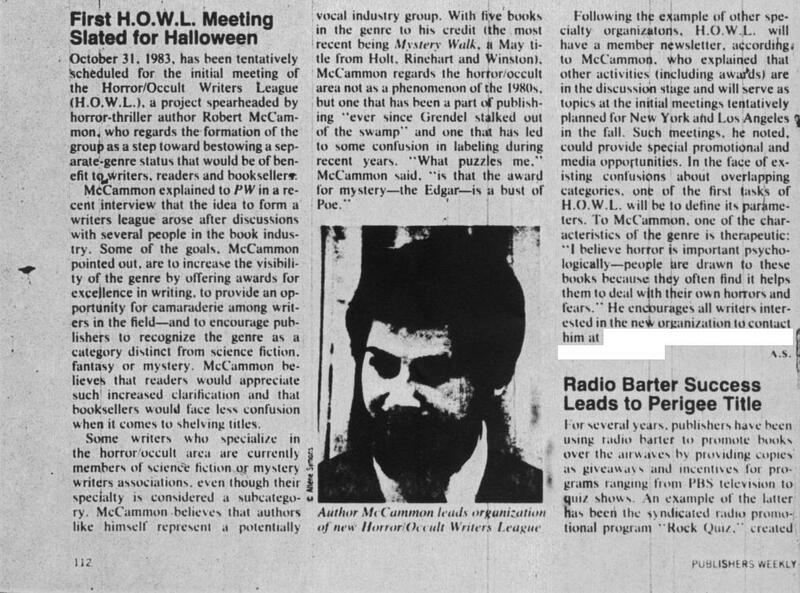 McCammon explained to PW in a recent interview that the idea to form a writers league arose after discussions with several people in the book industry. Some of the goals, McCammon pointed out, are to increase the visibility of the genre by offering awards for excellence in writing, to provide an opportunity for camaraderie among writers in the field—and to encourage publishers to recognize the genre as a category distinct from science fiction, fantasy or mystery. McCammon believes that readers would appreciate such increased clarification and that booksellers would face less confusion when it comes to shelving titles. Some writers who specialize in the horror occult area are currently members of science fiction or mystery writers associations, even though their specialty is considered a subcategory. McCammon believes that authors like himself represent a potentially vocal industry group. With five books in the genre to his credit (the most recent being Mystery Walk, a May title from Holt, Rinehart and Winston), McCammon regards the horror/occult area not as a phenomenon of the 1980s, but one that has been a part of publishing "ever since Grendel stalked out of the swamp" and one that has led to some contusion in labeling during recent years. "What puzzles me," McCammon said, "is that the award for mystery—the Edgar—is a bust of Poe." Following the example of other specialty organizations, H.O.W.L. will have a member newsletter, according to McCammon. who explained that other activities (including awards) are in the discussion stage and will serve as topics at the initial meetings tentatively planned for New York and Los Angeles in the fall. Such meetings, he noted, could provide special promotional and media opportunities. In the face of existing confusions about overlapping categories, one of the first tasks of H.O.W.L. will be to define its parameters. To McCammon, one of the characteristics of the genre is therapeutic: "I believe horror is important psychologically—people are drawn to these books because they often find it helps them to deal with their own horrors and fears." He encourages all writers interested in the new organization to contact him at XXXXX, Birmingham, AL.